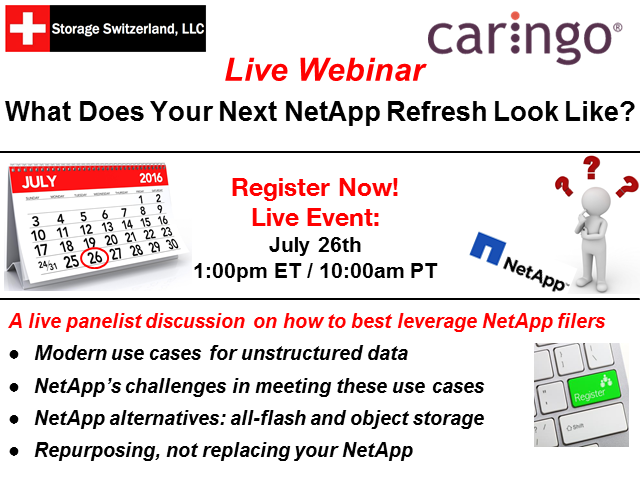 What Does Your Next NetApp Refresh Look Like? Most organizations making an investment in NetApp Filers count on the system to store user data and host virtual machine datastores from an environment like VMware. In addition these organizations want their NetApp systems to do more and be the repository for the next wave of unstructured data; data generated by machines. NetApp systems are busting at the seams, so these organizations are trying to decide what to do next. Title: What Does Your Next NetApp Refresh Look Like?